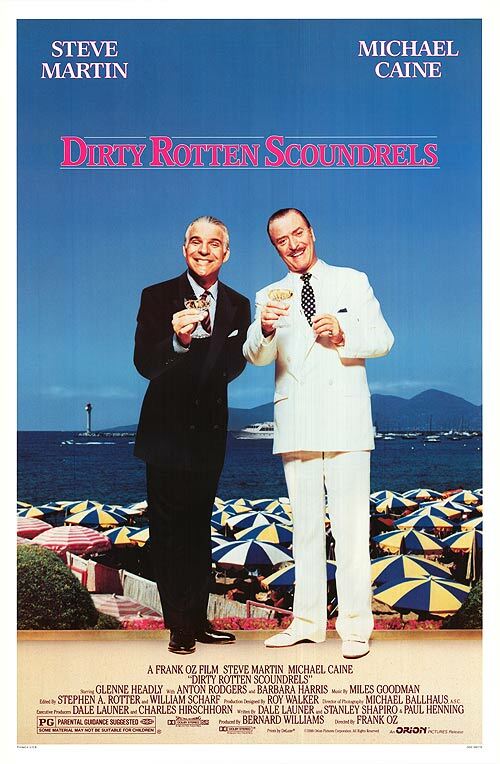 Dirty Rotten Scoundrels. Orion Pictures 1988. No reputation of this movie has reached me. It was a recommendation based on other films I’ve had interest in, and I picked it up because I thought it was a different movie with George C. Scott. This sounds like a premise with great potential though. Michael Caine is a scam artist trying to get Steve Martin from horning in on his turf. Since I hadn’t heard of it before, it can’t be as good as I expect, but it sounds like fun. Lawrence is a high society confidence scammer. He makes his living by tricking wealthy ladies into giving him money, often by posing as royalty to vacationing Americans. On his way to his accustomed Riviera operating base, he runs into Freddy, a low-class scam artist making his way through Europe on an antifeminist philosophy of living off the women to turn the tables. They soon each realize that the other one is in the same game, and try to fight for the right to keep the town. Eventually, having run out of tricks to play on each other, they settle on a bet: whoever can get $50,000 out of Jennifer Colgate, the Soap Queen, gets to keep the town. But the masquerade they fall into for this con may go beyond what either of them has attempted before. The second half of this movie was hilarious. The first quarter was pretty funny. Unfortunately, most of the second quarter was an excuse for Steve Martin to act ridiculous. It’s unfortunate partly because the film dragged until his character arrived. Michael Caine alone made me chuckle moderately here and there, Steve Martin alone made me laugh some, then after some back and forth, Lawrence decides to make Freddy go away by humiliating him in the form of “training from the master.” The result is Steve Martin performing as a sexually candid mentally retarded “brother” in Caine’s latest scam, which was far more awkward than it was funny. The fun only really picked up afterward. Caine spends half the movie swapping back and forth between his normal accent and a German one, pretending to be a famous psychiatrist, and it’s as seamless as a confidence man should hope to have. His Australian accent at the very end seemed pushed too much, but he only used it for one line. Meanwhile, the only difference between this Steve Martin role and most other performances is that all the heart he expresses is supposed to be faked. Sometimes in other roles he may lay it on too thick, but this part was perfect for him. As the story wound to a close, I wasn’t sure what outcome I wanted to hope for. However, the twist was not the one I was expecting, but did facilitate an end even more satisfying than the one I was sure was coming. I feel like I should be able to talk about the views of the surroundings, but I don’t recall being struck by any Riviera vistas. Watch this movie: ready to press “chapter skip” when Lawrence agrees to teach Freddy. Don’t watch this movie: paying too much attention to Michael Caine’s facial hair.